Do the steps feel loose? Does it need new safety feet? Does it need the rivets replaced? 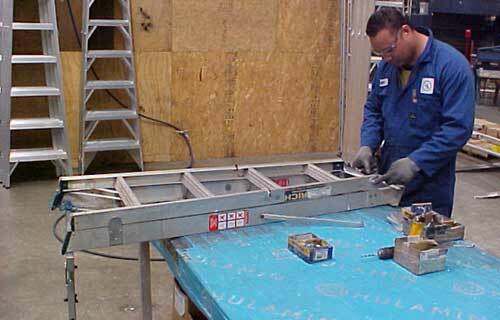 Ullrich offer a Ladder INSPECTION and REPAIR SERVICE available from 17 different locations throughout New Zealand. Minor repairs can be carried out at each location with major repairs being carried out at the closest of our 6 factories across the country. We can provide a FREE COMPREHENSIVE SAFETY CHECK and give you a quote to bring your ladder up to a safe working standard. IF NOT REPAIRABLE we will trade in your old ladder by giving you a discount on a new one. Call in at any Ullrich Branch, they will be pleased to help. For BUSINESSES WITH MULTIPLE LADDERS WE CAN HELP YOU TOO - we can handle any number of ladders, give us a try. We can also provide you with a ANNUAL INSPECTION SERVICE. Talk to our sales people, they will look after you.